This article describes a simple but accurate Morse beacon keyer for VK3FI’s 600m beacon from Mildura Vic. On advice from the 600m group on Yahoo, the beacon message is mainly QRSS3. The message contains a 12WPM ident message “= VK3FI = QF15CT =” then a QRSS3 message “VK3FI” and wait and then about 90s of unmodulated carrier. The keying pattern repeats every 5 minutes exactly, timing controlled by a crystal reference and good enough for image stacking over several hours. There are also QRSS6 and QRSS10 messages loaded at addresses 1 and 2. Above is the QRSS10 message, it is entirely QRSS10 with a 10min cycle time. QRSS10 has a theoretical 4.8dB S/N advantage over QRSS3, but in practice, most packages will implement bandwidths in powers of 2, so the advantage is likely to be 6dB (as it is in Spectran above for example). The QRSS bandwidth in Spectran is 0.084Hz, that is 45dB lower than the JT ‘standard’ of 2500Hz. Whilst normal CW is copyable by ear at S/N of about -6dB in 2500Hz bandwidth, QRSS10 is copyable for S/N of about 5dB in 0.084Hz bandwidth, and advantage of 45-(5–6)=33dB in detection / identification. Note that this is considerably better than WSPR, but does require human decoding. Duffy, O. 2012. Simple Morse beacon keyer. VK1OD.net (offline). ———. 2012b. 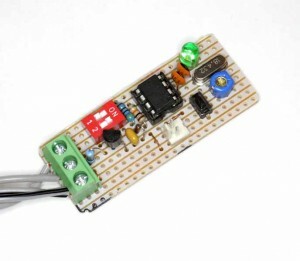 Another simple Morse beacon keyer – basic, but accurate. VK1OD.net (offline).